Today's passage is Luke 1:57-80 and Isaiah 43:1. Not everyone is excited to go home for Christmas. Not every family party is filled with laughter and Christmas cheer. For some of us, the idea of family is associated with dread, not joy. A lot of families are a source of major pain. Most of my family relationships you would consider strained, at best. Holidays just magnify the effects of that strain. Once upon a time, I thought my family was normal. However, I've learned my family of origin was held together with guilt and obligation. The "love" I received became a debt to be paid. I owed big for whatever "love" I got. There were expressions of "I love yous", but actions proved otherwise. It felt suffocating, overwhelming, and laborious. That "love" was extremely fragile, and I was always waiting for it to shatter. It often did. As I grew up, I learned that it wasn't love at all. It took me over two years of therapy to sit on my counselor's couch and say "I feel sad". I had no idea how to formulate an emotion, much less name one. Whenever people ask me "how are you? ", I usually respond with how my husband or son are doing. I have no idea how to answer that question. I was really never asked that question as a child. If ever I had feelings of sadness or frustration, they were relabeled as "dramatic", "selfish", "ridiculous", and sometimes even "crazy." I was punished for having emotions. All the happy photographs were just a mirage, a perfectly polished lie to trick people into thinking we had a happy home. We had happy moments, but we didn't have a happy home. There was no trust, and there was a lot of sorrow. I recently had a visit with a high school friend very near and dear to my heart. We caught up, and we talked about our lowest places. Mine was my family. She said "Sara, I worried about you a lot. It's like you had a death wish." You know what? She's right. I spent most of my life wishing I were dead. I'm super perceptive about other people's emotions. It's very easy for me to pick up on what other people are feeling and help them through their tough times. But to this day, processing my own emotion, ANY emotion, is the most excruciating thing imaginable for me. I often feel empty, and that's the safest place for me to stay. Just today, I had a very tearful sad day. My husband knew this because I had texted him about it while he was at work, and he walked in the door and said "what are you feeling?" I LAUNCHED on him saying "Don't ask me what I'm feeling! That's the worst thing you can ever do!" Poor guy. He was just trying to help, and my heart breaks for him with how I reacted. I don't know how to receive help. I still don't always know how to receive love. BUT--the love I have with my husband feels different than the love I grew up knowing. It feels free. It feels safe. It feels kind. It feels stable. It feel soft. Even in the middle of a storm, our love may sway in a violent breeze, but it endures. Even during the deep dark bad times, I feel confident it will never break. If I can be really real for a sec, I feel a twinge of envy when I hear my friends talking about their happy holiday homecomings. I hear about the hugs, the excitement, and the joy… and what I feel is loss, or even grief. I have always felt sort of homeless this time of year… like I don't belong anywhere. It's never easy, and I'm not sure it will ever be resolved. I was reading the story of John the Baptist's birth, and the joy and pride his parents felt is palpable in the story. I imagine their faces stained with tears from happiness, not sadness for a change. They waited SO LONG to become parents. I can only imagine the overwhelming elation they felt as they looked at their precious baby boy. I absolutely LOVE what Zechariah has to say about his son! He is proud, hopeful, and confident his son will change the world. Imagine if your family had that kind of joy and pride for you. I sincerely hope and pray they do. But if they don't, think about what it would be like for you. Maybe it's hard to even think about or imagine because your family is so dysfunctional. Maybe you don't even see or talk to your family anymore. Maybe you've never even met your family. Maybe you feel hopeless and alone this time of year. But our great God is that joyful family you're looking for. You don't have to place our hope on anyone in this world. He is that joyful loving family you've always wanted. You may not be able to trust people, but you can always trust Him. He made you in His image, gifted you with talents and abilities, and redeemed you through Christ. There is no shortage of love with Him. His love is explosive, bold, an beyond all comprehension. 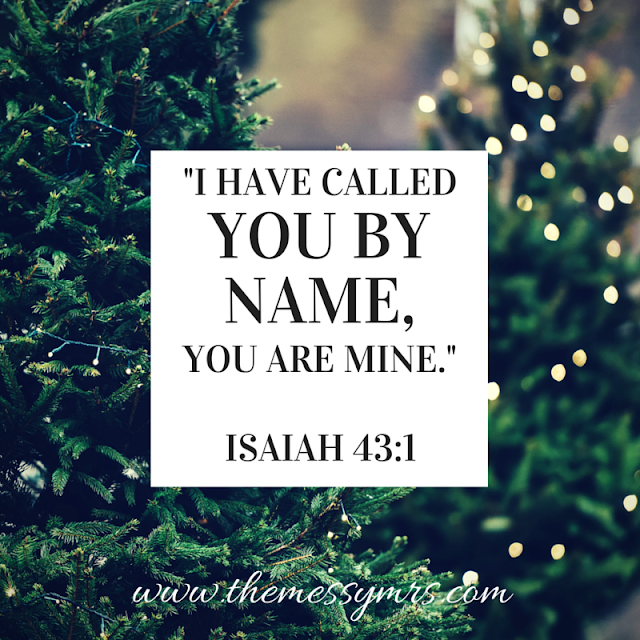 He is yours, and you are His.